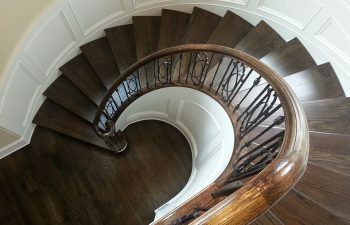 Two of our most popular custom staircase offerings – curved stairs and wrought iron handrail systems – are both versatile design choices and can be crafted to match any style. When paired together, the two create a striking and sophisticated appeal. 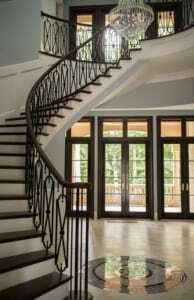 This week, we share some of our favorite curved staircases with wrought iron handrail systems. Our first project features beautiful dark treads with white stringers and risers. The eye-catching stair is further accented by the stunning ornamental metal rail system. The unique balustrade system projects a light and airy feeling, a perfect fit for this custom home. Next, another curved staircase makes a unique statement with its wrought iron handrail system. 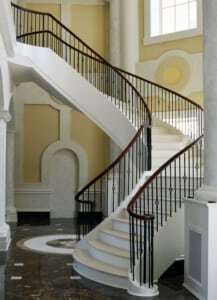 Like the project above, the ornamental metal features round shapes, perfectly complementing the arc of the stair itself. 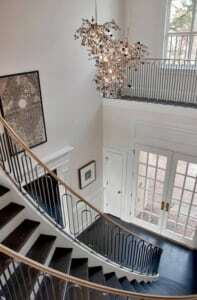 The round balcony completes the project and highlights the space’s gorgeous chandelier. Our third wrought iron curved staircase system is another illustration of sophistication and elegance. 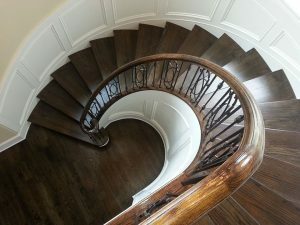 The simple wrought iron balusters offer clean lines, allowing the curved stair and the unique trim to take center stage. Our final featured staircase is another excellent example of the level of sophistication wrought iron can bring to a curved staircase. This birds eye perspective highlights the beauty and appeal of this design. Experts in building codes and regulations, our team will ensure that your curved staircase is perfectly constructed with full code compliance. Our in-house team of artisan welders will hand forge the wrought iron handrail in our metal fabrication facility. To ensure a perfect fit, we will pre-fit the handrail system to the staircase prior to delivery and installation. Our team will also pre-fit the ornamental metal handrails to the staircase prior to delivery and installation. No matter how custom and unique the handrail project, we employ a proven, turn-key approach that ensures flawless execution throughout all phases of construction. Our robust project management system promotes organization and excellent communication, and our team has earned an outstanding reputation for timely and smooth delivery. We make the process of ordering custom stairs and ornamental metal handrails simple. If you have a specific design in mind, our team will work collaboratively with you to bring your vision to life. If you are seeking inspiration or ideas, we will help you to explore your options and make the best possible decision for your style and needs. Our reputation speaks for itself, and client satisfaction is our highest priority. From inspiration to installation, our team is committed to delivering the highest quality products. 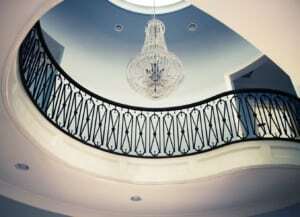 Contact us today to discuss enhancing your home with a beautiful curved stair and wrought iron railing.